Dip Prawns into flour, shake of excess. Dip in egg wash, followed by panko crumb. Be sure that there is an even coating of panko on the prawns and press down gently to ensure it sticks well to the egg wash. Repeat until all prawns are coated. Heat fryer to 180C and fry until golden brown, approximately 3-4 minutes. Transfer to paper towel and season with salt to taste. In a small bowl, add mayonnaise, sriracha, kaffir lime and lime juice and whisk to combine. Lightly toast slider buns under the grill for approximately 1-2 minutes. 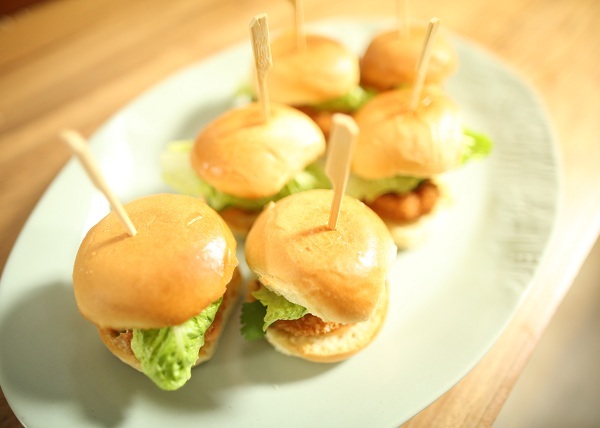 Assemble sliders with Sriracha mayo on the base, followed by 2 prawns, a couple of coriander leaves, and topped with lettuce. Serve immediately.